P1: Between the shrieking plants ahead and the mud monsters in back, John Carter had little choice as he sought to run in the sticky ooze of the cavern floor. P2: Now a plant reached out a grotesque, hand-like stem and jerked the Earthman from the sucking ooze. P3: The mud monsters spluttered in disappointed anguish as their prey was snatched from their grasp. P4: "By my leaves and petals!" cackled the Plant Man who held Carter. "You are a man-thing of the outer realm." P5: "I come from another world far out in space," replied the Earthman. "A world where plants are silent and men should be." P6: A great roar of laughter echoed from the strange herbs. "The man-thing is humorous," they cried. "Pass him along for the king to see." CHAPTER 50: "Between Ooze and Leaf"
John Carter stood transfixed between the shrieking plants, on one hand and the living darkness of the cavern on the other. From where he stood nothing around him made much sense. It occurred to the Earthman how tired he was -- exhausted in fact. If he could just sit down and rest for a while, perhaps then he could sort out the baffling situation. "No! No! Don't stop now, little man!" a voice called out. "The mud-men will get you!" The warrior looked about him to see where this shout of unsolicited advice had come from and he was astonished to see a human-faced, long green vine, wrapped around the hanging limb of a nearby tree. Perhaps "human-faced" is not the exact thought that came to him at that moment, but the vine ended in a large blossom, the center of which featured eyes and a mouth something like his own. The vine-flower with a face was swaying from the tree branch in a way that could not be attributed to the wind or some other external force. If he could believe his eyes, the man was gazing upon a moving, talking, flower which could see and hear him. "This is madness!" he called out, as if in answer to the weird talking thing. "Yes! Yes! Come back to us, or you will go mad!" other voices answered. There appeared to be no choices open to him other than going forward in the direction of the shrieking plants, or back to the living darkness. The leafy canopy above him was far too dense to allow jumping, and on either side of the path he now found himself upon, the thorny undergrowth was absolutely impenetrable. Given the discouraging prospect of returning to the sticky ooze of the cavern, an adventure among intelligent plants appeared to be the better option by far, even if it entailed madness. Try as he might, however, he could take a single step forward. After several attempts at walking in the direction of the plants, all Carter had accomplished was backtracking from the mushroom growths a number of paces toward the cave mouth. A plant reached out a grotesque, hand-like stem and jerked the Earthman from his continual retreat. The mud monsters behind him spluttered in disappointed anguish as their human prey was snatched away. "So this is madness?" John Carter asked rhetorically. "Or perhaps a mad nightmare? Or -- or is this the dreadful end that comes to anyone who is affected by the insidious drugs purveyed by the Wizard of Eo?" "By my leaves and petals!" cackled the plant man who held Carter. "You are a man-thing of the outer realm." 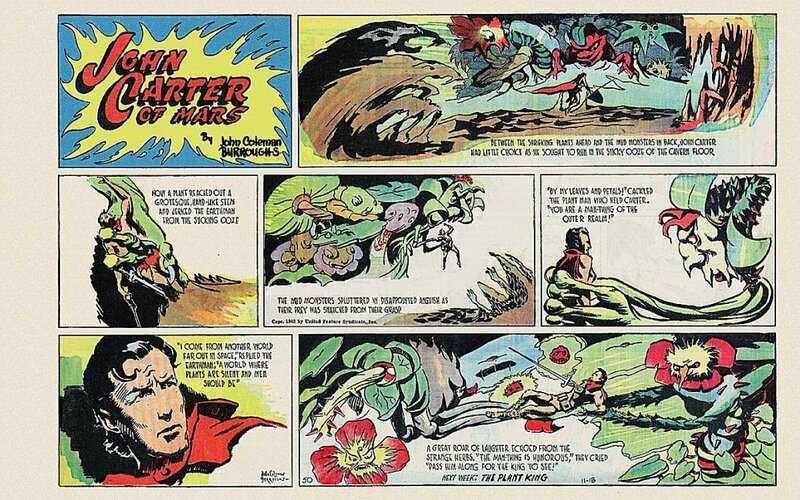 Captain Carter, in his own accounts, speaks often of his fascination with the myriad forms and colors unique to the flowering plants of the red planet. No doubt he had already come upon specimens of the various carnivorous plants of Barsoom, including those species having light-sensing spots in the middle of their blooms. An imaginative mind might easily connect those harmless little growths with the huge talking flowers of Eo, as described by Captain Carter. Indeed a similar evolution may be seen in the writings of Charles L. Dodgson. While Captain Carter has never admitted to being much of a reader, it is a curious fact that his friend, James K. Powell, once carried on a lengthy correspondence with Mr. Dodgson. The talking plant man held John Carter in an amiable embrace, a little distance from its intelligent looking face. He was not far off the ground and the Earthman might easily have escaped the hand-like vines, but he elected to stay and learn all he could about these remarkable beings. "Maybe he is from Cluros, or even Thuria!" another talking flower chimed in. "You are not far wrong," answered the Virginian. "I do come from another world -- from a planet far out in space." "By my roots and branches!" continued the first plant man. Tell us something about the flowers of your planet!." "Well, I can truthfully say that they are not so clever as the flowers of Barsoom. I come from a world where plants are silent and madmen like myself should be also." This response brought forth great roar of laughter from the assemblage of talking greenery. Sensing that he had stumbled upon a way to insure the strange creatures' continued amiability, John Carter added another comment. "The very next time that I go out among chicken-men, dragon-fish, four-legged spiders and mud-men, I honestly promise to visit all of you and relate my many madcap exploits." Again peals of merriment of echoed from the strange flowers. "The man-thing is humorous," cried one of them. "Pass him along for the king to see," shouted another. Only then did the visitor from another world realize that all of the intelligent plants were firmly attached to vines, branches and the trunks of trees. The closest his experience could come to classifying them was as a Martian equivalent to earthly orchids -- though a few of them looked a little more like non-blossoming fly-trap plants. Nothing in his study of life on the dying planet prepared the Earthman for his encounter with these talking oddities. And, although the experience forever remained vivid in his memory, it is safe to say that the gentleman from Virginia never again talked with plants after this particularly fanciful meeting. Convinced beyond a doubt that his sanity had already snapped, Captain Carter joined in the revelry of the plant men and voiced no objections as they moved him along at a good pace from one set of hand-like tendrils to another.